I decided to stay home because I’m committed to homeschooling. And while some people succeed at working outside of the home and homeschooling at the same time, I’m not one of those people. Trust me; I’ve tried. Secondly, it’s not financially feasible for me to return to work. It’s ironic, but getting a job outside the home means I’d actually have less money. Reason being: childcare. Even if I send my two oldest to school, I still have a child who’s not school age. Childcare for just one child, whether in daycare or with a nanny, is incredibly expensive where I live. This means that I’d have to find work that paid well more than what childcare costs, which in my field(s), doesn’t happen very often. So I stay home, homeschool my kids, and do most things around the house. And at one point, this created a gigantic identity crisis, and I’ll be the first to admit that I hopped back and forth between stay-at-home mom, employment, and self-employment several times in the past eight years. But that’s because I hadn’t found the best fit yet. And then freelance writing happened, quite by accident. Freelance writing has given me incredible freedom to live life exactly the way I want to live it. From homeschooling my kids to planning awesome trips in an RV (yep, now that we’re fully recovered from our necrotizing fasciitis scare, we’re planning something big! ), freelance writing has given me the freedom to truly live life on my terms. Not only does freelance writing pay extremely well (if you know who to pitch and how to say no to low-ballers), it’s fun, keeps me from getting bored, and gives me an identity outside of “just mom.” Props to the moms who love to be just mom, but as someone who has been working and contributing financially to the household since I was old enough to work, being just mom just wasn’t what was working for me. Not a writer? Not a problem. There are plenty of other work-from-home job and side hustles that you can do on a part-time basis. Whether you choose to do it for a bit of extra pocket cash, to make some online friends, or to start getting ready for a full-blown self-employed career when the kids are grown and gone, here are some ideas for awesome side hustles for stay-at-home parents. Whenever there’s a post written about side hustles or making money from home, you bet there’s going to be “survey sites” listed. It makes me wanna puke. Most posts that mention these sites mention them just because the writer has a vested interest—you sign up, they get some sort of bonus. Here’s a gig that actually pays in real cash, and pays well, too. You’re not going to get rich from doing this gig, and it may be a while before a test matches your profile, but each test pays $10 for about 15 minutes of your time. Best of all? They pay out every test after exactly 7 days, via Paypal. Real cash for real work. All that’s required? That you’re good at thinking out loud. Anyone who knows me will tell you this is the perfect side hustle for me, since I never shut up (yeah, I admit it). UserTesting is a website that allows people to test other websites. Companies pay UserTesting to get feedback on their websites or app prototypes. UserTesting gets freelancers to sign up for these tests and complete them, and then they pay you once you’ve completed the tests. All you have to do is remember to think out loud while you’re doing the tasks the tests require, and ensure you’re doing your test in a quite environment. Of all the side hustles I do, this is the most fun. I get to review websites, share my opinion, and I don’t have to wait around to get paid. Side hustles like these are great for work-at-home freelancers and children alike. If you don’t already have your own pets, pet sitting can be super fun. Recently, my 8-year-old daughter earned $40 for pet-sitting a friend’s dog for 2 weeks. We were provided with all the necessities, and all she had to do is make sure his bowls were filled and that she walked the dog and picked up his business once a day. She did amazing, learned that she needs to work if she wants money, and I got to hang out with a super friendly dog to boot. Take a tip from my daughter and offer to petsit your friends’ furry kids. As an adult, you’ll probably be able to charge more than what my daughter did. Just make sure that whatever pet you decide to petsit is an easy-going animal and that you know what’s required for taking care of it. Liking animals helps, too. If you’re crafty, you may have things you’ve already made sitting around. Take a few minutes to snap some photos and list them for sale in local Facebook groups, and other local sales sites (Kijiji is a popular one in Canada; VarageSale works, too). If you have stuff you own that you don’t really care about, selling that stuff can net you some pocket cash as well. For me, personally, this has never worked, but it’s worth mentioning for anyone who might want to do little things here and there to start accummulating some pennies (and I’m not kidding when I say pennies). Sites like MicroWorkers have listings of small little jobs you can do to earn some pennies, and in some cases, one or two dollars. Do enough of these, and you might have a little pocket cash. These are little jobs that take 5 or fewer minutes to do, so the idea is that they’re a quick way to make a wee bit of pocket money. Reality is different. If you’ve got time on your hands to sift through the suggested jobs, you can sign up for a few here and there and potentially earn some money. Personally, I’d rather write. Even when I don’t get paid. If you’re ready to get a little more serious and earn a part-time income from your side hustle, there are a few things you can do. By far, my favourite is blogging. Blogging is not a get-rich-quick scheme, and it’ll take a few months before you see any real money. You’ve got to set up your blog, write the content, promote it, grow your email list, and build a following before you can even attempt to sell anything. Then you have to sign up for the affiliate programs and/or make the digital products you hope to sell. It’s hard work, it takes a long time, and it’s hard to grow on a part time basis. But don’t despair. I said it’s hard. I didn’t say it’s impossible. There are a tonne of people out there making a good part-time income by blogging. Many people have to work over full-time hours to start earning a part-time income, and eventually that can be reversed. But if you have time to grow a side hustle, you can take your time and start earning eventually. To start a blog that’ll eventually earn some money, you’ll want to self-host. I recommend using WordPress as your content management system (CMS) and Siteground as your hosting company. You’ll also need a plan of action for the strategies you’ll use for earning an income. The most common ways to earn money from a blog are to use affiliate marketing, sell information products, sell freelancing services, or place ads. Stay tuned for a post that goes into all of this in more detail. Just like blogging, it takes time to grow a freelance writing side hustle (I should know). But if you do the right things and pitch the right people, it can be one of the most lucrative side hustles. I’m currently making a full time income from my part-time freelance writing. But I wasn’t always making this much. I started with lower paying gigs, built a reputation, and then started pitching private, large clients. Freelance writing, truth be told, isn’t my favourite of side hustles. I’d rather be blogging. But because I’m more established as a freelance writer, that’s what currently gets me paid. Eventually, I hope to just blog and sell my own digital products. EBooks tend to be shorter than physical books, so if you can commit to putting some short books together, you could certainly earn some dollars from selling eBooks on sites like Amazon. You won’t get rich from doing it, and this side hustle also takes time. You’ll need to do some research to figure out what categories sell best, and what you should write about. The advantage of writing eBooks for sale is that publishing them can come at zero cost. I still highly recommend hiring an editor at the bare minimum, and a digital book layout person if you can afford it, but you can always barter for these services as well. Stay tuned for a post that will go into the step-by-step process for publishing an eBook. 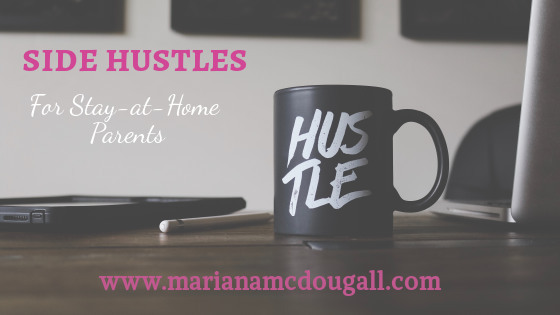 So I know there’s tonnes of blog posts out there offering 20, 30, 50, or even 99 ways to make money with side hustles. For this post, I’ve chosen to just share the ways in which my family has made a few dollars. By far, the most lucrative side hustle I’ve done so far is freelance writing. It took me about 6 months of part-time work before seeing part-time income from my endeavours as a freelance writer, and about a year before I started making a full-time income. It’s not a gigantic full-time income, but it’s still a good income. What side hustle will you try next? Next Next post: Family RV Adventure Announcement!